“I know politics. And I know politics has become a race for money…not a race for service, not a race to improve the country. 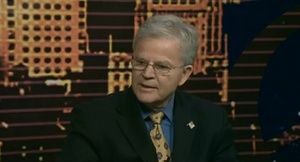 Just a race to get re-elected,” Roemer said in an interview with WEBN’s Kate Spalla. Roemer served in political office from 1981 to 1992 and later taught at Harvard University as a Kennedy Fellow. After leaving Harvard he founded three community banks in Louisiana. Earlier this year he registered to run in the New Hampshire Republican Primary. During his interview with Spalla, Roemer spent most of his time discussing his favorite issue: corruption in government. He believes the country is “heading in the wrong direction” and the best way to divert its course is through bipartisanship. Roemer said if he were nominated as the GOP candidate to run against President Barak Obama, he would look into having a “conservative Democrat” as his running mate. To set an example for the other candidates Roemer’s campaign will not be accepting any money from a political action committee (PAC) or a super PAC. His website accepts maximum donations of $100 a person. Though he is on the New Hampshire primary ballot, Roemer will not be appearing in the ABC debate being held at Saint Anselm College on January 7. He said every time he tried to register for the debate “the rules kept changing.” Despite that setback, he was optimistic that his message would resonate with Americans.